Gasoline prices have been strong this summer, though they’re still below last May’s peak, when the national average was near $3 a gallon. Still, averages can be deceiving. Retail prices vary a lot by location. States have different tax rates and environmental requirements, and transporting gas to stations in remote areas costs more. But the weird part is that even gas stations in the same city can charge significantly higher prices for near-identical products. Economics postulates that rational consumers seek the lowest available price… but apparently many don’t. Are they ignorantly wasting money, or is something else going on? The answer is “Both,” and I have the data to prove it. Long-distance drivers can spend a substantial part of their income on fuel. 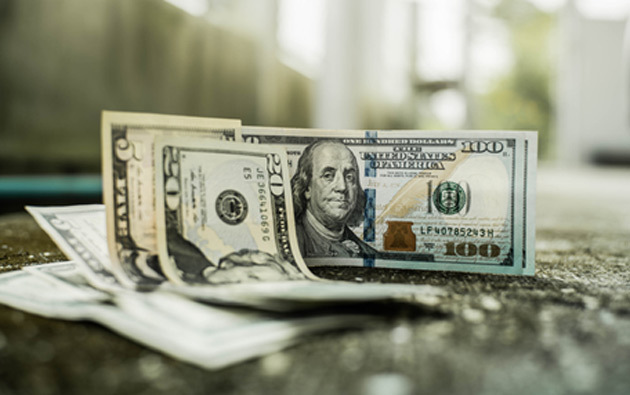 Economic theory says they will seek to minimize that expense, but the data suggests many don’t. A free app called GasBuddy gives us the evidence. 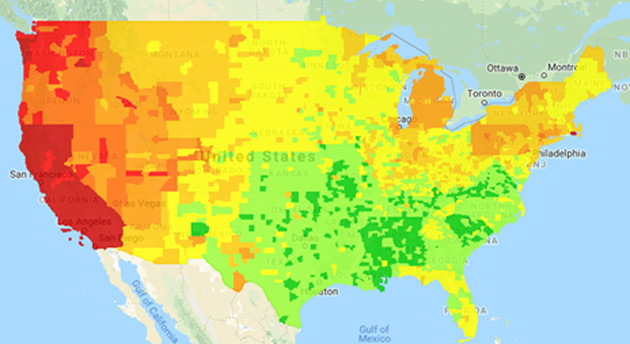 Users report gas prices at their local stations, and GasBuddy compiles the information into a constantly updated database. Here’s their recent national heat map. Dark green is the lowest prices, dark red the highest. The Gulf Coast, or the inland areas connected to it by pipelines or highways, tends to have lower prices. Gasoline is most expensive on the West Coast where local production is minimal, taxes high, and environmental rules more stringent. No one drives from California to Texas just for cheaper gas. 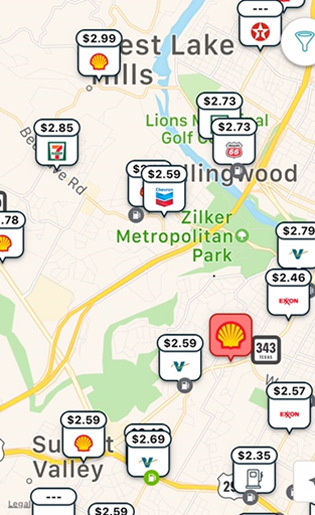 But GasBuddy lets you zoom in to find your local area’s lowest prices. Here’s how part of Austin, TX, looked one day last month. You can see in the upper left a Shell station where regular unleaded was $2.99 per gallon on that day. In the lower right, an off-brand station sold its gas at $2.35. These two stations are about eight miles apart—and at one of them, the price was 64 cents per gallon higher. That’s an extreme example, but I’ve found a 30- to 40-cent spread is common, just within the area I drive for my usual errands. So I can potentially save that much on gasoline while never going out of my way. I just check ahead on the app and stop at the low-price station. This is free money. Why don’t more people grab it? Well, some folks are brand loyal. They think Exxon gas is better for their car. Fair enough. But prices vary even for the same brand. In the area mapped above, Exxon gasoline ranged from $2.46 to $2.85. Why pay more? Time is also a factor. People like to combine tasks. They fill up the tank when they grab those tasty breakfast tacos even if the gas costs a little more. Or maybe they dislike the awkward U-turn that would save them 10 cents a gallon. Again, fair enough. Those are legitimate choices… but they’re not free. You still pay for them. But really, the biggest factor is just force of habit. Most people like staying on familiar ground. Which is fine, but it means you miss opportunities. 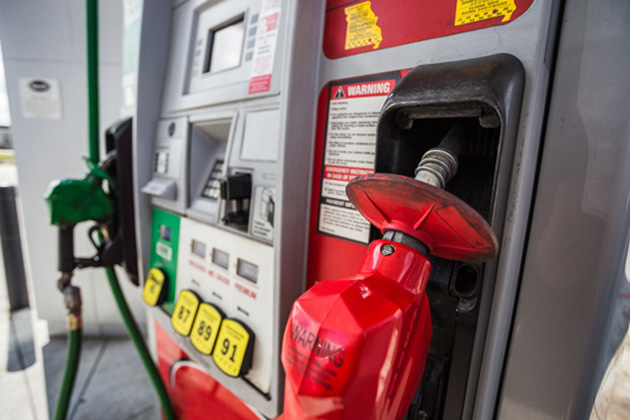 Whether it is worth shopping around for gas depends on how many miles you drive and your vehicle’s fuel efficiency. Heavy-use drivers or those with gas-guzzling vehicles could save a lot by watching the gas price. Say you’re a building contractor, and your extra-large pickup gets 12 miles per gallon. You visit several job sites a day, driving 3,000 miles a month. That’s 250 gallons of gas. If you reduce your average price by 20 cents a gallon—which is easy and costs almost nothing—you save $50/month or $600/year. You can buy something nice with that money. Or better yet, add it to your retirement savings. Invest well, and it can compound into a much larger amount. More typically, let’s say you drive 1,000 miles a month and your car gets 20 miles per gallon. That means you burn 50 gallons of fuel. Saving 20 cents a gallon adds up to $10/month or $120/year. While that’s not as impressive, it’s not nothing either. You get $120 for keeping your eyes open and maybe making an extra U-turn or two. Obviously, this is a personal choice that I can’t make for you. But I can make two suggestions. First, get the GasBuddy app and check the price range where you live. I bet you’ll be surprised. Second, if $10 a month is still no big deal to you, use it to buy an Over My Shoulder subscription. That’s the premium service in which John Mauldin and I share some of the best economic research we encounter. It’s useful, interesting—and you’ve already decided the price is negligible. Or do both: Use my GasBuddy tip to save on fuel and use the savings to get Over My Shoulder effectively free. I think the knowledge you gain will repay you even further by enhancing your investment results. If it doesn’t, cancel any time with no hard feelings. Click here to learn more… and drive carefully.